Your water heater is an important part of your home’s plumbing system. Most people don’t give it a second thought unless it isn’t working like it should. 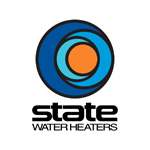 If it’s time to replace your water heater we recommend considering a heater from State or A.O. Smith. These manufacturers provide reliable efficient water heaters that include gas, electric, high efficiency, and tankless models. These water heaters may cost more than other brands but any water heater is an investment, so why not invest in the best one that your budget allows? Many of these water heaters are so efficient that they qualify for energy saving rebates.